Being invited to witness a time-honoured ritual on a remote island in Papua New Guinea is something many travellers dream about and even fewer people ever get to experience. This is the invitation that expeditioners aboard Heritage Expeditions’ recent ‘Papua New Guinea Explorer’ were fortunate enough to receive when they arrived at Eiaus village on Misima Island. The village has never been visited by tourists and the last 'white skinned' visitors were Canadian goldminers 15 years ago. 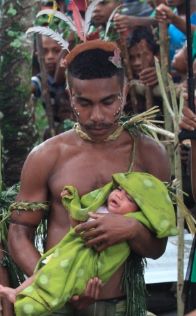 It is likely very few outsiders have been fortunate enough to witness the ceremony where a newborn and parents are presented to the village for the first time. After being welcomed via a traditional ‘Sing-Sing’ to Eiaus, an island village that sits snugly in the Louisiade Archipelago, expeditioners and locals alike gathered at a modest family house to witness the proceedings. Set amongst the garden where the family go about their daily lives, expeditioners and locals blended together as the mother and father were cleansed with hot water before being adorned in palm leaves and having their faces painted by family members. The ceremony occurs after an extended time of isolation from the rest of the village, so the excitement of meeting the newborn was palpable. Cheers broke out from locals and expeditioners as the newborn was brought out and placed in the father’s arms. Following the ceremony, those in attendance were offered a feast of tender pork stew, rice, yam, and tropical fruits as well as enjoying the buoyant atmosphere. It was a huge honour bestowed upon the expedition to share in this special moment with the village and one that will live on in the memories of the expeditioners aboard. 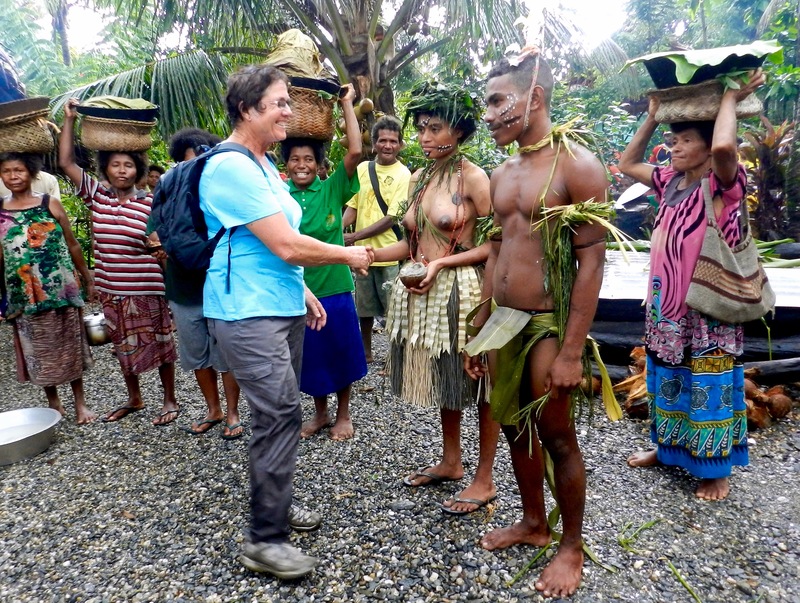 Heritage Expeditions explores the islands and villages of Papua New Guinea, providing authentic and unique experiences and genuine cultural exchanges. With a capacity of just 50 expeditioners on each voyage, the ship ‘Spirit of Enderby’ can access islands, villages and waterways that larger ships often cannot reach. The small expeditioner numbers aboard also are conducive to a flexible daily programme allowing for the unique opportunities that present themselves as the voyage unfolds. The next expedition to Papua New Guinea, Melanesia Discoverer departs 14 October 2016 from Madang, Papua New Guinea and is priced from $6995 USD (NZ and AU prices available).